Diplomat (rank of Minister-Councelor). Professor of oriental studies at Moscow MGIMO University (from 2008). Scholar with decades-long experience on East Asian and global issues. Since 2008 he has been working for the Russkiy Mir Presidential Foundation in Moscow as chair of regional programmes, coordinating, inter alia, Asian and African programmes. He served two postings in North Korea at the USSR trade mission (1977-1980; 1984-1987), worked for trade promotion agencies related to Asia. Georgy Toloraya served at Russian Foreign Ministry, was minister counselor of the Russian Embassy in South Korea (1993–1998), First Asian Department Deputy Director-General (1998–2003) and Consul General of Russia in Sydney (2003–2007). He collaborated with a number of academic institutes (among them IMEMO and Institute of Economics) as a full-time and part-time researcher and was a visiting fellow at the Brookings Institution, Washington, DC (2007–2008). Author of more than 200 articles and 7 books on East Asia and global governance issues. North Korea and Russia are planning to meet in the near future, amid the aftermath of the frustratingly unsuccessful US-DPRK summit. The state visit could increase both Russia's value in the Korean diplomatic process and Russia’s role as a mediator between other nations. This will give the summit’s participants more freedom to manoeuvre, Moscow State Institute of International Relations (MGIMO) Professor Georgy Toloraya, executive director of Russian National Research Committee on BRICS research, says. The second summit of US President Donald Trump and leader of the DPRK Kim Jong-un took place in Hanoi, the capital of Vietnam, on February 27–28. High hopes were pegged on this summit: the sides were expected to push forward the denuclearization process of the Korean Peninsula and also to reach agreements on the end of the state of war. ﻿The Korean theme at the Eastern Economic Forum-2018 is the most notable. This is not accidental, because a moment of truth came for Russian policy towards the Korean Peninsula. It is time to choose whether we will actively pursue our line or adapt ourselves to the strategy and tactics of other countries, taking into account common geopolitical interests. ﻿Normal working relations with Pyongyang is the trump card that Russia can use in the complex diplomatic game around North Korea. 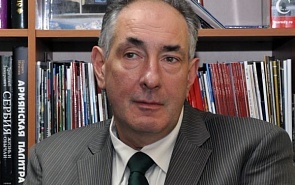 Professor Georgy Toloraya, Executive Director of the Russian National Committee on BRICS research, Director of the Asian strategy center at the Institute of Economics of the Russian Academy of Sciences, spoke in an interview with valdaiclub.com about the importance of the planned Putin-Kim summit and how it can contribute to the solution of security issues on the Korean peninsula. ﻿If they ask, “What BRICS is about?” the answer will be: “BRICS is about the world order”. It creates its own structure of global governance. Therefore, this group should offer the world an alternative model of socio-economic development based on the market and new technologies, but different from the current system that assumes the dominance of the West. Russia-South Korea Dialogue: Opening New Horizons? ﻿On June 22, 2018, Russian president Vladimir Putin met with South Korean president Moon Jae-in. Professor Georgy Toloraya, Executive Director of the Russian National Committee on BRICS Research, spoke in an interview with www.valdaiclub.com about the results of the meeting, economic cooperation between the two countries and the role of Russia in solving problems on the Korean peninsula. In reality nothing happened: the signed document has the general character. It repeated everything that was already mentioned in other documents of the United States and North Korea since the "framework agreement" of 1994. From now on, North Koreans will play along to the Americans. They have achieved the main thing: if the negotiations continue, North Korea is already unconditionally recognized as a nuclear power. Kim-Trump Summit: Will David Defeat Goliath? Apocalyptic anxiety about inevitable war on the Korean peninsula late last year is now about to give way to elation and waiting for a positive shift in the Korean peaceful settlement. The temptation is great, but for me, the exaggerated optimism characterizing the disputes of the Korean issue, is actually a point of concern. In the wake of recent developments in Korea, Russia is drifting farther from the center of events.The fact that the North or the South never mentioned the Russia-backed six-party (with its participation) settlement format, and the four-party format idea, serve as another reminder of that fact.The only positive development is the agreement of the two Koreas to resume work on the Trans-Korean railway, which can give a new lease of life to our project to connect it with the Trans-Siberian Railway. A Rebalancing China and Resurging India: How Will The Pendulum Swing For Russia?